The platform employs innovative and creative web functionalities to harmonise multilingual, interdisciplinary and pan-continental climate change knowledge, with the aim to encourage project developers and stakeholders to learn and benefit from Africa’s challenges and success stories. AfriCAN Climate was set up by a team of 5 African and 5 European organisations, including research institutes and dissemination networks. The portal targets a wide variety of climate change stakeholders, including researchers, field practitioners, project developers, NGOs, local/ national governments and farmers’ organisations. ‘Good practice’ can mean many things depending on the context. The AfriCAN Climate is a platform that aims to bring together experiences from across the continent of Africa. Therefore, it is useful to talk about practices defined or considered as ‘good’ by the governments, academics and civil society organisations from within those countries, taking the view that good practice must refer to “something that works”, as well as being widely approved by local stakeholders. In order to feature on the AfriCAN Climate portal, projects must aim to mitigate and/or adapt to climate change. Secondly, projects are evaluated against eight good practice ‘principles’ to assess their financial, economic, social and environmental sustainability, and case studies are structured so that it easy to find what each project has done in relation to the eight principles. The good practice principles are intended to encourage critical reflection and help project developers draw out relevant lessons of interest to a broader audience of African stakeholders. The 8 good practice 'principles' outlined below represent critical cross cutting issues shared by the majority of climate change projects, regardless of mitigation/adaptation focus, scope and scale. The principles are intended to encourage critical reflection from project stakeholders and help them draw out relevant lessons of interest to a broader audience of African stakeholders and project developers. How have projects designed to mitigate or adapt to climate change in Africa built upon or applied the findings of specific research projects and/or vulnerability studies? Also, how have projects actively contributed to international understanding on a specific topic or area of research? This section provides examples of how particular projects have actively engaged and benefited from collaboration with universities and research organisations within Africa and beyond. 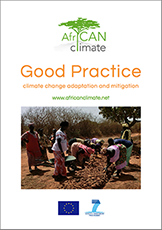 How have projects designed to mitigate or adapt to climate change in Africa consulted with local communities in the formulation, implementation and decision making process? How were gender issues incorporated? This section provides examples of how particular projects mobilised local interest and ownership in order to ensure its activities responded to the verified demands and needs of local beneficiaries. How have projects designed to mitigate or adapt to climate change in Africa secured high-level political support for their activities? This section provides examples of how particular projects secured the support and active participation from political-level stakeholders, and how the project’s aims and activities were alignment with wider development agendas. How have projects designed to mitigate or adapt to climate change in Africa secured financing for sustaining and/or expanding the project’s impacts beyond the initial project lifetime? This section provides examples of how particular projects secured national (e.g. government) and international (e.g. international donors) support for sustaining their impacts and/or replicating / scaling its activities. How have projects designed to mitigate or adapt to climate change in Africa taken into consideration the costs and benefits external to the project, e.g. on employment, environment, health, poverty levels, food security etc? This section provides concrete examples of how particular projects aimed to maximising external co-benefits from project activities and avoid/minimising external costs and damages. How have projects designed to mitigate or adapt to climate change in Africa ensured that local capacity was built during the implementation of the project? This section provides examples of how particular projects integrated training programmes into core project activities and the measures taken to assure that built human capacity is maintained and replicated beyond the project’s lifetime. How have projects designed to mitigate or adapt to climate change in Africa ensured that their activities can be transferred beyond the specific contexts in which they were implemented? This section provides examples of how particular project measures, activities or concepts could be/have been applied in another context or regions and how successful these efforts have been to include transfer in the design and practice. How have projects designed to mitigate or adapt to climate change in Africa have demonstrated their impacts in terms of achieving the project objectives, outcomes, and outputs. This section provides examples of how particular projects developed indicators, and how effective they have been in applying these. Download 8 principles here, with case study examples for each.